There was an unusual act caught on the stump mic in the ongoing ODI series between Pakistan and South Africa. The Pakistan cricket captain, Sarfraz Ahmed, stirred a controversy in the second ODI match when he reportedly called his counterpart 'black guy.' 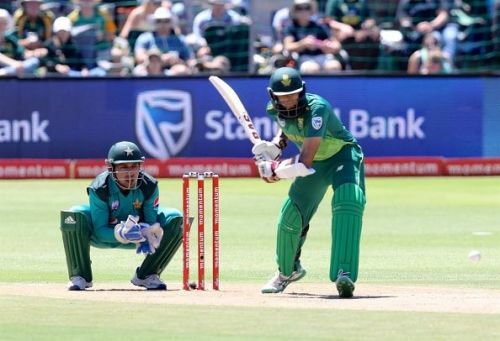 The wicket-keeper batsman was heard commenting on the South African all-rounder Andile Phehlukwayo, during the 37th over of the match in Durban. It is unfortunate for the game that such racist comments are made and that too by the opposing team's captain. South Africa may have won the match but, the sport was embarrassed. Sarfraz said things that definitely breached the ICC anti-racism code of conduct and therefore, he may have to serve a four-match ban. The ICC is yet to announce any such suspension. As quoted on the ICC website about the anti-racism code, "This Policy - one of the toughest in world sport - confirms a level of commitment from the ICC and its Members to promote and encourage participation at all levels regardless of race, color, religion, descent, culture and/or national or ethnic origin and to ensure that there is no discrimination in the sport. The Policy contains a series of clear but flexible requirements for each Member, whether Full, Associate or Affiliate, in terms of the Member’s own conduct, its education, and training of others, its communications with spectators and others, and its reporting to the ICC, each in respect of International Matches played within its jurisdiction". "Further, it requires ICC Members to impose punishments on spectators found guilty of racial abuse, which may include ejection from the venue or a ban of a specified period from attending venues within the Member’s jurisdiction to watch cricket and to deliver preventative measures at international matches. It also contains a series of similar requirements upon the ICC, to reflect the fact that the ICC is primarily responsible for compliance with such matters at ICC Event." In a recent case, according to The Times of India, Australian fans were forced out of the stadium when racist shouts of "Show us your VISA were heard, against the Indian team at the MCG. Another incident involving Australian commentator Dean Jones came up during the Sri Lanka tour of South Africa in 2006. When Hashim Amla took a good catch of Sangakkara, at the point and the cameras zoomed into Amla, Jones was heard saying, "Terrorist gets another wicket." Later he was removed from the commentary panel of Ten Sports. One more such incident was the Monkey-gate controversy, involving Bhajji and Symonds, in 2008 India tour of Australia. When Harbhajan edged a ball from Lee, Symonds came up to him and gave a harsh look, in reply Bhajji reportedly used a Hindi slang which Symonds mistook as 'monkey'. After hearing both the sides, match referee charged Harbhajan with 50% of match fees, for using abusive language. Such conduct is prohibited under the ICC's Anti-Racism Code and must be dealt sternly. Pakistan skipper made the comments in Urdu which is obviously not understood by the South African players. Sledging in cricket is common but the players should not be allowed to go down to this level and make such racist comments. Cricket is a gentleman's game, and hence, the opposition players need to be respected, for the spirit of the game. Sarfraz could find himself in trouble after breaking the anti-racism code. Any such misconduct in this sport is not tolerable, and therefore, ICC can be strict on the Pakistani player. Hence, if Sarfraz is banned, it could set a good example for the rest of the players that any such instances will not be tolerated, in the sport. Sarfraz is a right-handed batsman and has been playing for the Pakistan National Team since 2007. He is also the captain of the team and therefore, he needs to set a good example for the rest of the players and avoid making such comments. What has happened cannot be undone but, players should avoid making such comments on the field as they are playing the same sport and competing for the same thing.